Every ten years or so it comes time to purchase a new mattress for you or your family member. The reality is: purchasing a new mattress can be an extremely difficult task. It’s hard to know whether you’re receiving a good deal or not, and there are tons of different companies to choose from. With the advent of online commerce, hundreds of new companies have entered the market to try and compete with the industry titans. Many new manufacturers are able to offer much lower prices, but sometimes their quality and reputation isn’t as good. Stearns and Foster is one of the most recognizable mattress brands in the country. It’s a brand that’s owned by Sealy – one of the nation’s largest mattress manufacturers. Sealy is a company that was started in 1881 in Texas – they’ve been producing mattresses for over 135 years. If you want to work with a company that understands how to produce a solid product, this might be your best. Stearns in Foster is one of their most popular brands. While they’re not as cheap as many competitors, they do have a solid reputation in the industry. For the purpose of this review, we’re going to be looking at one of the most affordable Stearns and Foster mattresses on the market – the Stearns and Foster Estate Mattress. This mattress also happens to be the most affordable mattresses they offer – but this isn’t to say that it is of lower quality. If you think this might be the right mattress type for you, our review will be able to tell you all you need to know before you make a decision. Should I Buy a Stearns and Foster Mattress? It’s time to get down to the details. If you’re someone who is looking to purchase a new mattress, it’s always important to understand how it’s built. Don’t let a mattress salesman sell you a dream, it’s important to make sure that you understand how the mattress your purchasing is built. This is the best way to understand what you’re buying and whether or not you’re getting a good deal. The Stearns and Foster Estate Mattress is made using a very complex system – it produces one of the most unique mattresses on the market. Each component is designed for a specific input. The top layer of the mattress is made from a Stearns and Foster custom foam named Advanced Adapt Foam. This layer of the mattress is made to provide you with as much comfort as possible. It allows you to sink into the mattress and creates contour around your body. This layer is what feels soft to the touch when you lie on it! The second layer is also there to help with comfort. It’s made from a Stearns and Foster PrimaSense Gel Foam. This foam not only provides comfort, but also ensures that the mattress stays cool throughout the night. This is a great feature for those of you who often overheat while you sleep. The third layer is the main support layer. It uses a Stearns and Foster coil system called IntelliCoil Advanced. This system uses individual coils to provide plenty of support – it also adapts to the body. The coil system allows air to flow through which ensure the mattress doesn’t overheat. The bottom layer of the mattress is actually surrounds the lower bits of the mattress. It’s made from a Stearns and Foster PrecisionEdge System that ensures proper edge support and improves the sleeping surface. This is a very thin layer so it is not a true support layer. The cover of a mattress is always important, and this is even more true when you purchase a Stearns and Foster Estate Mattress. The top of the cover is made from a proprietary PrimaCool Performance Fabric that ensures the mattress cools well and is comfortable to the touch. It’s thin enough that it doesn’t interfere with the comfort of the memory foam. The side of the mattress is made from a much thicker material and includes Stearns and Foster Air Vents that allow the mattress to breathe. All-in-all it’s a great mattress cover! The Stearns and Foster Estate Mattress is extremely comfortable. The multi-layer system means that you are sleeping on a mattress of very high quality. The top of the mattress will contour around your body as you sleep on it. If you want to purchase a mattress that makes you feel like you’re sleeping on a cloud, this is a solid option. The Stearns and Foster Estate Mattress comes in four different editions: Ultra Firm, Firm, Cushion Top, and Plush. The one you choose will dictate softness and firmness. In terms of support, they range from around a 4.5/10 to an 8/10 on our scale. You can find out more information about the firmness by selecting the mattress type that you wish to purchase. One of the most important features of the feel of this mattress is that it cools extremely well. Stearns and Foster understands that memory foam has a reputation for retaining heat, so they’ve done as much as possible to help reduce the risk of this. The gel foam, coil system, and air vent cover all do an excellent job of ensuring there isn’t too much heat retention. It’s a great mattress if you’re trying to avoid overheating. The cover and inner PreceisionEdge System also ensure there is plenty of edge support. You can sit on the side of this mattress very comfortably. Stearns and Foster has been around for a long time. 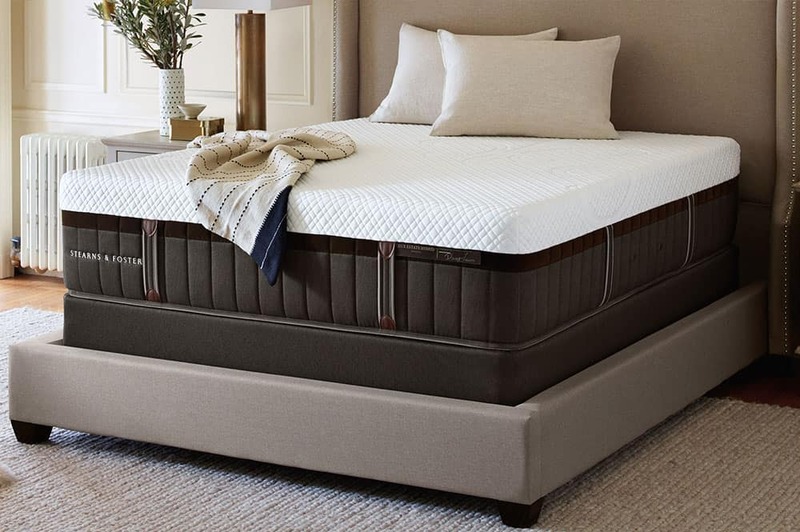 The mattress company hasn’t made any significant changes to the Stearns and Foster Estate Mattress, but they do constantly update their current offerings. Make sure to keep an eye out for new mattress lines and products. Don’t underestimate how additional benefits and features can matter when you’re purchasing a mattress. It’s always important to make sure that you purchase mattress that includes more than just a mattress. If you want to be a responsible purchaser – always know what else the company offers you as a customer. Many of these benefits can be extremely crucial to making sure that you enjoy your mattress as much as possible. New competitors in the market have forced heavy weight like Stearns and Foster to include as much additional benefits as possible. These benefits might end up saving you thousands of dollars – if you end up having a problem with your mattress, it’s nice to know you have some ways to recuperate your money. This section will examine all of these benefits to make sure you fully understand what you’re purchasing. Ensure that you fully understand all the different points listed below. Enjoy! You should always be aware of what type of warranty is offered with your mattress. This is the single most important features to understand. A mattress that costs thousands of dollars is no cheap investment – you need to be certain you’ll be able to keep the mattress for as long as possible. If a mattress company doesn’t offer a good warranty, this is probably because they don’t believe in their own product. Always ask more information about a warranty if information is scarce. The Stearns and Foster Estate Mattress comes with a Stearns and Foster 10-year warranty. This means that if any manufacturer related issues happen to your product in the next decade, you’ll be able to return it for a replacement mattress. You can file a warranty claim through the Sealy website or the retailer you purchase the mattress from. Stearns and Foster sells their mattresses through a variety of different retailers. This means that you can purchase the mattresses online or in-store. It also means that you can try out the mattresses if you’re someone who prefers to test products before you buy them. To find out which retailers currently offer Stearns and Foster Estate Mattresses, head to their website and you’ll find a way to search for authorized retailers. Trial periods allow you to sleep on the mattress for a number of nights to help you understand if you want to keep it or not. You’ll still have to pay for the mattress upfront, but you’ll be able to return it for a full refund if you don’t like it. The trial period for the Stearns and Foster Estate Mattress depends on the retailer you purchase the mattress from. Many retailers do allow you to try out the mattress for up to 120 days, so this is definitely worth looking into. It’s the best way to be certain you enjoy the mattress you purchase. Stearns and Foster often run different promotions and sales to make their mattresses more attractive. At present, if you purchase any of their mattresses you will also receive a free box spring. This means that you won’t have to spend as much money setting up your mattress once you purchase. It greatly reduces the cost of the mattress – many box springs can cost you well over $100. Keep your eyes peeled for more promotions and offers. It’s rare that you find an American company that produces their products locally. It’s been much cheaper to outsource production to overseas locations in order to save money on labor and inputs. But Stearns and Foster understands the importance of making products locally in the United States. If you want to work with a company that ensure their mattresses are manufactured by local workers, you should consider purchasing a Stearns and Foster mattress. It’s a great way to show your support for American workers and local industries! 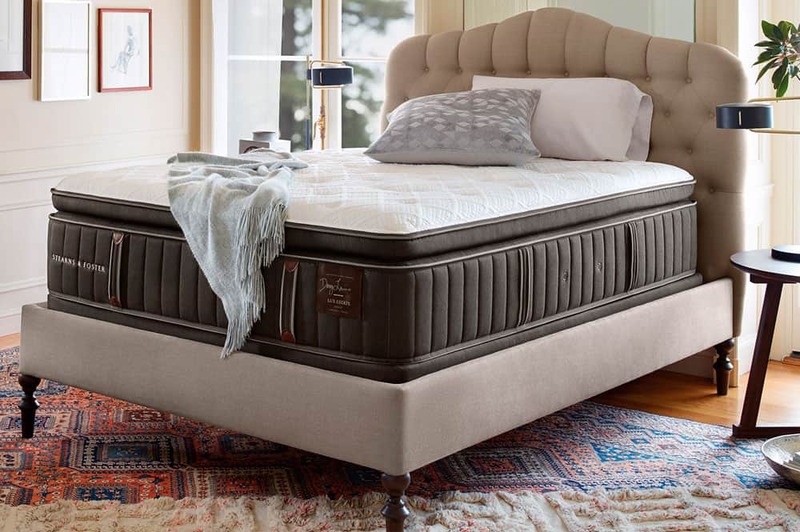 Lastly, Stearns and Foster is a Sealy mattress brand – this means that Stearns and Foster is backed by one of the world’s most formidable mattress companies. Sealy is popular for a reason – they have shown their ability to produce high quality mattresses over a prolonged period of time. In addition, this means that warranties and guarantees are much safer – it’s highly unlikely that a company like Sealy would go out of business any time soon! As you can see, there are plenty of reasons to purchase the Stearns and Foster Estate Mattress. You’ll be able to enjoy a mattress that uses a complex system to provide you with the ultimate sleeping experience. You can choose from a variety of different comfort levels to help you get the exact amount of comfort and support you’re looking for. In addition, you’ll be able to benefit from a great warranty and a range of other benefits. If you want to compare this mattress against other industry mattresses, make sure to check out all the reviews on our site. We have tons of different reviews for our readers to take a look at. We also have some other informative articles that can help you find the perfect mattress.